This project was developed to reduce the image frequency response of my direct conversion receiver. 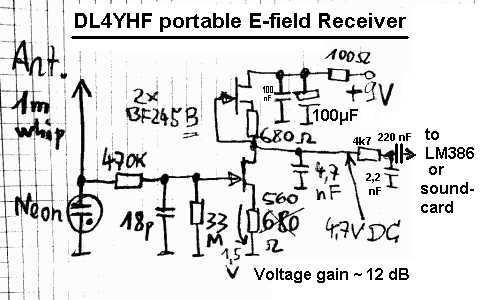 It can also e useful as front end for HAM communications receivers and also for selective level meters used as LF receiver. The project focus was selectivity, not gain. If you want to use a a small multi-turn loop on LF, you will find that the sensitivity is not good enough to receive the weaker signals. A good preamp for a loop needs to have a high input impedance and good signal handling characteristics (to prevent cross-modulation). Most modern tranceivers cover LF but the performance is not always very good. All you can hear are strange whistles and burbles which aren't really there! You need this little circuit. It has a gain of about 10dB and a nice sharp band-pass response about 3kHz wide, enough to cover the 136 band. This article describes how to use your PC as a receiver for narrow-band signals in the VLF radio spectrum.